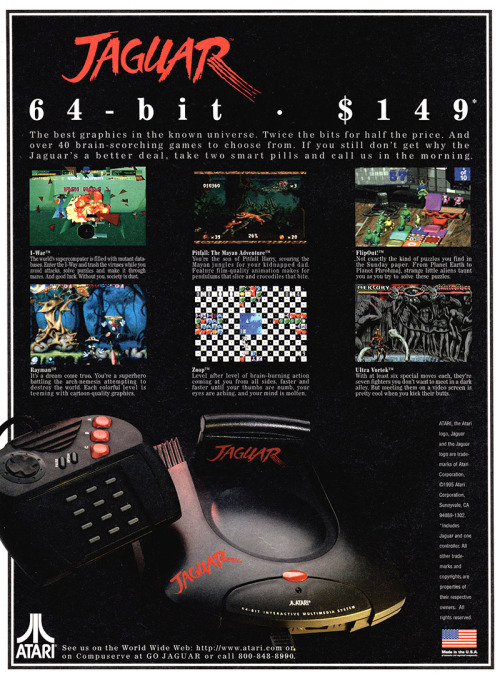 While 64-bit may have been a bit of an exaggeration (the Jaguar used two 32-bit RISC processors as well as a Motorola 68000), it was still an impressive system, technically speaking, at the time it was introduced. It clearly outclassed the popular 16-bit counterparts of the time. Unfortunately, as with every Atari system after the 2600, it was lack of software that really killed it. Relatively poor 3rd party support plus 1st party support that was often done as cheaply as possible just isn’t a recipe for a successful system. “Tom”, a 26.59 MHz processor with a 32-bit RISC core used as a GPU, 64-bit Blitter and 64-bit DRAM controller. “Jerry”, a 26.59 MHz processor with a 32-bit RISC core similar to “Tom” but with a larger cache and other components intended for sound processing (two DACs, wavetable synthesis, FM synthesis). It was also responsible for timers and joystick control. In addition, there would be a CD-ROM add-on that would add to the complexity of the system. While there would be a number of very good games for the Jaguar, there just wasn’t enough. Atari always seemed hesitant to put the marketing and software development resources behind their systems that could have made them more successful. 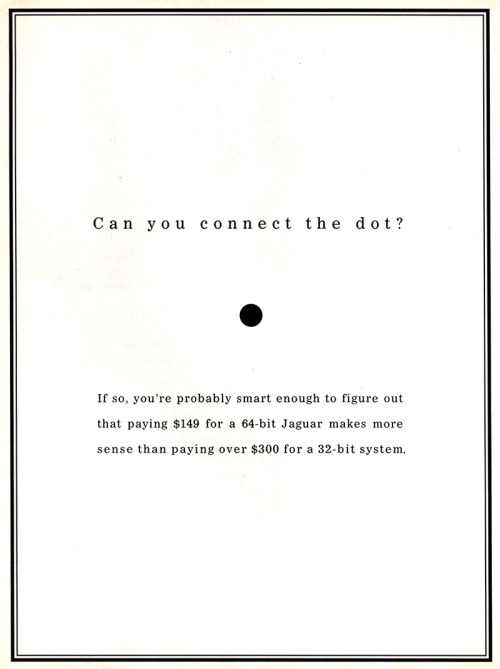 This ad is from a little later in the life of the Jaguar and it’s doing somewhat bad math to try to illustrate the superiority of the Jaguar to the new 32-bit systems. It wasn’t superior but it was certainly a bargain by comparison at $149.